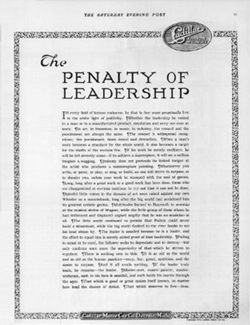 The Penalty of Leadership was an ad written in 1915 by Theodore F. McManus of MacManus, John & Adams that appeared only one time in the Saturday Evening Post. According the Ad Age’s Advertising Century: Top 100 Advertising Campaigns, The Penalty of Leadership ranked #49. Although never mentioned explicitly in the copy, it was written for the Cadillac brand which at the time was experiencing problems and was being challenged by Packard. With auto industry executives recently knocking on Congresses door, The Penalty of Leadership makes interesting, if not ironic, reading.